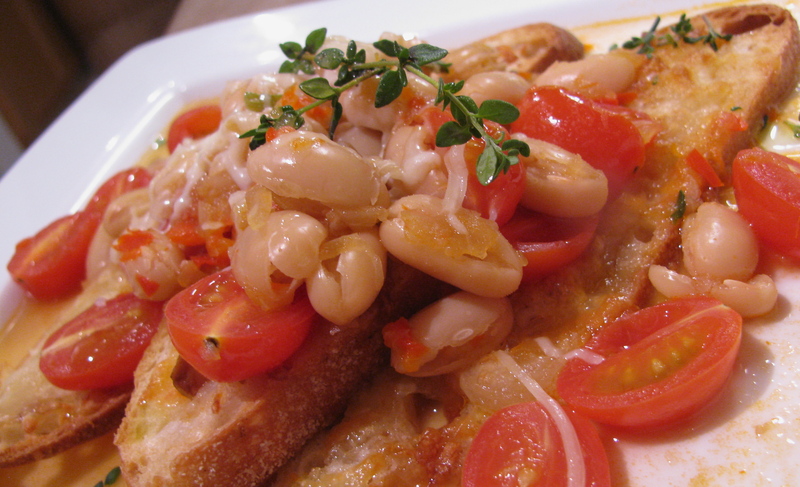 A few weeks ago, I came a across this amazing recipe for a white bean ragout on crostini. It’s been so bitterly cold here in Chicago and a hot, filling dish that warms from the inside really hits the spot. Wow! Not only was it done in less than 30 minutes (prep included), but it was amazingly tasty, healthy and low cal! About 500 calories, less than 10 grams of fat and loaded with proteinWe loved it so much we served it at the local community shelter a week later. The residents raved about it! I tweaked the original recipe a bit – mainly adding more garlic, tomato paste and thyme – so while I can’t take complete credit for this, I put a few of my own touches on it. Enjoy! Coarsely chop the onion and bell pepper. Throw them in food processor along with the garlic and pulse until the veggies are finely minced but not pureed. Slice the grape tomatoes in half lengthwise. Slice the baguette at an angle to create longer slices, approx ½ – ¾ inch thick. You should have 12 – 18 slices. Place the baguette slices on a foil-lined baking sheet and top each slice with 1 tsp of cheese. Heat a Dutch oven or large pot over medium heat. Also, preheat the oven to 450F. Heat the EVOO in the pot for 1 minute. Add the onion and pepper mixture and sauté for 3 – 4 minutes. Add the tomato paste and sauté for another 2 – 3 minutes or until the tomato paste turns a rusty color. Add the beans, stock and thyme and bring to a simmer. Simmer gently, uncovered for 15 minutes. Add the tomatoes and cook for another 5 minutes. While the tomato cooks, pop the bread into the oven and bake for 5 minutes or until they’re golden brown. Place 2 – 3 slices of bread on a plate. Spoon 1 cup of the ragout directly on the bread and top with 1 tsp of cheese and a drizzle of EVOO. Eat up! I LOVE LOVE LOVE serving this atop the bread; it soaks up all the lovely juices. You could also serve this up in a bowl and just dip the crostini in the ragout. Try using Cheese and Roasted Garlic Crostini instead of just plain cheese crostini. The garlic adds an amazing punch! Go vegetarian and use veggie stock instead. Beef stock would rock too! I used an Italian cheese blend but you can use mozzarella, parmesan, asiago or pecorino romano.